Geomines offers explosive hazards’ clearance services, both on land and at sea, in France and abroad, in compliance with the regulatory framework in force. Our teams are made up of experienced professionals, with decades of experience in the French armed forces and in operations abroad. 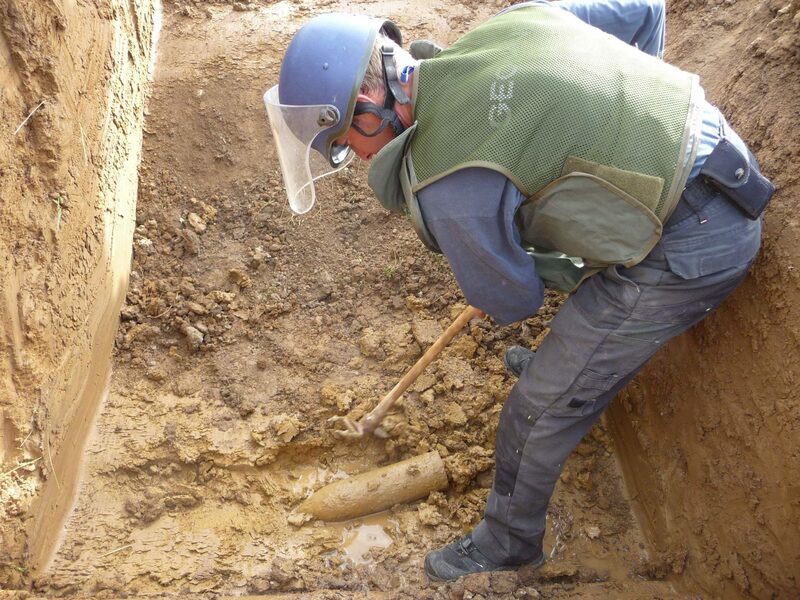 Geomines’ teams work on clearing landmines and explosive ordnance from soil, such as on military sites, industrial sites, ports, airports, railway stations, pipelines and, more generally, buildable land. Pyrotechnic decontamination operations may be preceded by historical studies (knowledge of the area, nature and number of ammunition likely to be discovered, pollution level, magnetic anomaly survey, GeoRadar characterisation), and pyrotechnic safety studies (determination of ammunition families and safety radii, possibility of temporary storage, possibility of destruction in furnaces, sensitive installations requiring special measures). The rehabilitation of the soil. Operations are conducted using detection tools and specific gear. Depending on the terrain and the targets to be processed, the teams opt for mechanical or manual clearance. Geomines works with respect for the environment and is committed to using the necessary resources for the protection of water resources, public and private roads, the cultural heritage and protected species present on different sites. Storage areas are rigorously marked and Geomines’ teams provide specialised waste management and disposal services. Firmly focused on providing companies support, Geomines offers them consultancy, assistance and support services in the context of pyrotechnic operations for the security of personnel: support for teams, diagnosis, detection operations, QA/QC, signage/marking and storage of ammunition discovered, in conjunction with local authorities. Geomines also offers assistance to companies for the reopening of sites and roads. Geomines conducts underwater explosives’ clearance operations and, as such, works on port expansion projects, the installation of wind farms at sea or the minesweeping of bridges in the wake of conflicts. Underwater pyrotechnic clearance operations involve a prior technical audit of the pyrotechnic diagnosis zone, the identification of targets, their uncovering and removal. These operations are conducted by our experts, former Navy minesweepers and clearance diving EOD units. They are competent to carry out deep underwater explosives’ detection operations. Explosives’ clearance training sessions can be provided directly in different countries. The training is then adapted to the trainee’s level and the types of threats encountered in the theatre of operation. The Risk&Co Group assists its clients with all services relating to the dismantling and management of ammunition stockpiles.